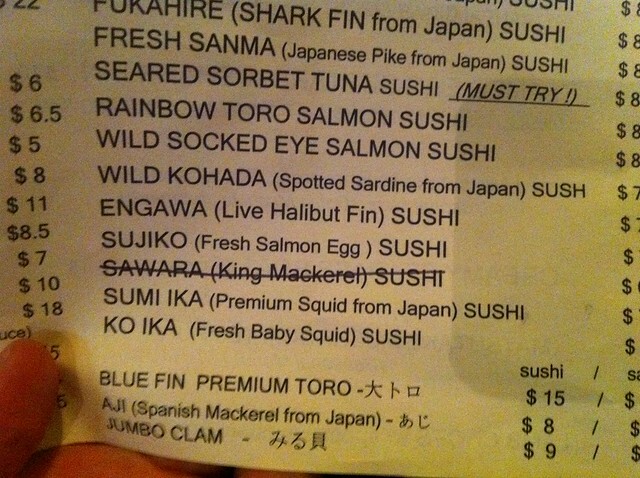 when theyre out of Sawara, the most delicious magical fish in the sea. karisa and i dined there last night after i chatted with the college kids. lemme tell you a few things about the youth of america – theyre alright. and i always want to let them know that although it might seem like an extension of high school its really closer to what college is like minus the beer bongs. they asked me some hard questions and some of them were really interesting. “what is the best blog post that you are your most proud of?” i was asked. ive written close to 10,000 blog posts when you think of the busblog, LAist, and the LA Times. i told them i was proud of it because i was really being creative and trying to tap into my biggest fears and horrors. “how old are you and when did you move to california?” was a question that everyone laughed when the guy said it. im 104 years old and i moved to california the day after high school with a banjo on my knee, i said. i said i would prefer girls to always come to my house with baked goods. but life doesnt always give you what you’d prefer. and sometimes you learn that what you thought you wanted was wrong. maybe the best person for a journalism job is a shy chinese girl. so yes, even you my chinese friend, has just as good of a chance of being a journalist as anyone. so ignore your friend and go for what you want.